PCB Pitch = 5mm(0.2″). 4 Way 90′ wire entry. 10 pieces per lot. Part number 20.501M/4SH. Depth 7.8mm. Height 10mm. Covers for DK2.5N and DK4N. Dinkle DK4N Blocks. Dinkle DK2.5N Blocks. DIN Rail (mm): 35, 32. Quantity: 50. Connection Conductor material. of connection points. Actuation Type. Manufacturer Part Number. Wiring Type. Pollution Degree. of potentials. Weco 307. Faston Distribution Connector. Polycarbonate Housing Material UL94 VO. 8mm Stripping Length. 44mm Fixing Centres, for M4 Screws (not supplied). 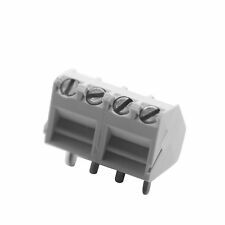 10 x 2-Way 5mm Terminal Block 10A. RoHS approved Yes. Barrel Brass / Copper. Min wire size 22 awg. Material PE/PP Nylon. Aluminum Rail 8", (20) DK4N Blocks Any Color, (2) DK2.5NC-PE Ground Block Covers, (2) DK4NC Block Covers Any Color, (2) DK4N-PE Ground Blocks, (2) DSS4N-10P Ten Pole Jumpers, (4) SS2 End Brackets. Rate Current: 30A. 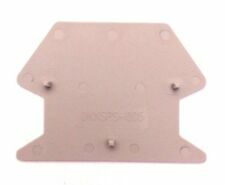 5mm Pitch Panel - PCB Mount. The 6 gauge inputs are all in common. Rate Current: 60A. DIN Rail (mm): 35, 32. TxHxW (mm): 10 x 49.3 x 42.9 (Individual Blocks). Condition: New. Insulating Material: PA. Wire Strip Length: 12-14mm. 5 x Wago 2-Way Compact Lever Connector 221-412. EC14 Earth Clamp Dry Conditions. DEBOX In-line Connector Box with 4 Pole Terminal Block HYLEC DEKSB-002. The 10 gauge inputs are all in common when the jumper is installed. Rate Current: 30A. DIN Rail (mm): 35, 32. Conductor Cross-section, Solid (AWG): 22-10. Conductor Cross-section, Flexible (AWG): 22-10. 12-Pole Plug & Socket 6A Terminal Strip HYPS-01712. End Cover (separate): DK4C-TF(5x20). Rate Current: 16A. DIN Rail (mm): 35. Technical Data (UL). Wire Strip Length: 10-12mm. Quantity: 12. Insulating Material: PA.
•Four 8 gauge outputs located on the right side of the block. GOLD POWER/GROUND DISTRIBUTION BLOCK. •One 0/2 gauge input adapter. •One 4/8 gauge input adapter. Pin Pitch Main Colour 1 Right angle 3 pin 5.08mm header. These are suitable for use in machine electronics, where secure interchangble parts are needed. Right angle. Parts list We are here to help you in any way we can. Rate Current: 30A. Conductor Cross-section, Solid (AWG): 22-10. Conductor Cross-section, Flexible (AWG): 22-10. DIN Rail (mm): 35, 32. Quantity: 40. Wire Strip Length: 9-11mm. They are 5mm spacing so they will slot straight into your PCB or breadboard allowing you to connect wires without soldering. Pitch: 5mm. Techna PtecNC Contact Block Normally Closed. SUNS International G-9604 Grounding Bus Bar. Nominal current: 12A. Pitch: 5.08mm. Technical Data Sheet. Panel mount. Number of Circuits: 2. Number of Wire Entries: 4. 2-Pole 32A Ceramic Connector Terminal Block DESTB-0252. 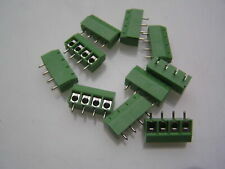 5 x 2-Way Wago 773-102 Push Connectors 2.5mm². Labels for DK6N, DK10N, DK16N, DK35N, DK6, DK10, DK16, DK16H, DK35, DK35H, DK50, DK95, DK150, DK240, DK6N-PE, DK10N-PE, DK10-PE, DK16-PE, DK35-PE, DK50-PE, DK95-PE, DK4-TF(5X20), DK4-TFL(5X20), DK4N-TF(5X20). SUNS International G-12808 Grounding Bus Bar. DIN Rail (mm): 35. 8" Aluminum DIN Rail. RoHS Compliant. It has spotting discoloration or small corrosion. Due to center-to-center distance of mounting slots, rails may be 7.75"- 8" long. DSS2.5N-10P 10 Pole Jumpers. Lot of 3 5-pole Extron captive screw phoenix connectors, sold as shown in the picture. UL and CSA Listed to 40A @ 600V. 12 Pole Position block can be cut to length and poles you need. Wire range is 18 - 10 AWG. DIN Rail (mm): 35. Total Length of Rail: 10 feet. RoHS Compliant. Due to center-to-center distance of mounting slots, rails may be 5.75" - 6" in length. RJ11 RJ12 6P6C Breakout PCB Board with Screw Terminal Block Connector. 6P6C Breakout Board. 3.5mm flat head screws Pre-drilled holes for mounting and attaching a cable tie for strain relief. PCB 1.5mm thick. Cable Strain relief with cable tie holes. Screw mounting holes. 4-Way Earth Metal Terminal Block Connector. Kulka 604 GP2402, 3 Pos Double Row, 70A 600V Terminal Strip w/10-32 NC Stud NEW!